10 Rules For Fat Loss in the FALL SEASON! During this “Second New Year”, many people focus on the damage they did coming to the end of the summer. When it comes to body change, there is a big difference between weight loss and what we want – FAT LOSS. Weight loss places a sole focus on calories. Fat loss focuses on calories too, but puts more focus on hormones. Fat loss is about eating in a way that controls the natural compensatory nature of your metabolism. During the programs that we launch at Cypress we TEACH these skills so you can use them for the rest of your life. We do not hold them like a magic key, we actually give them to you. Some of these keys we use for our Personal and Team training clients at Cypress Fitness in McLean Virginia have been taught to me by a good colleague and friend, Dr Jade Teta. When you experience changes in your sleep, hunger, mood, cravings, and energy your hormones are out of balance. Balance these and you will stabilize your body, resulting in all those keys that cause us to fall off the wagon during our programs. To balance these hormones – you need the right SLEEP – and more importantly foods rich in PROTIEN, FIBER and WATER. Magic right? 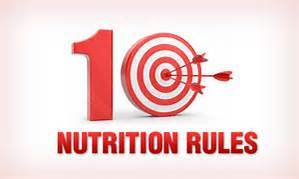 There are more to these rules and areas we teach to make people successful with their weight loss, but as a personal training studio and weight loss coach, here are our 10 most influential rules. 1. Spend equal time eating as resting: Your hormonal biochemistry works best in rhythms. You have to build it regularly so it will burn efficiently. You need times of increased energy and times for rest and recovery. You eat to build and do not eat to burn. You have to honor this system. If you make small little cheat eats all day long, you are going to mess with this body rhythm. John Berdardi of Precision Nutrition mentions breaking the day up in thirds, from the time you wake up until you fall asleep. Eating at every third will help you get a rhythm and help you control your energy, mood, sugar and cravings. 2. Find out your carbohydrate tolerance: During our weight loss programs, we always have our carbohydrate feedings as one of our “rules”. You need to decide what works best for you and that does come with a trial and error system. We always like to say you either get your Carbs in the morning (breakfast) and the first meal after your workout. You need to “earn” those carbs. Carbs are your energy. To much and you will store them. An alternative we like to give everyone is to forgo them at breakfast and eat them at night. This is especially important for those of us who might have a hard time falling asleep. 3. Yes, fat is good, but not in unlimited amounts: Just like #2 we have to find what works for us. I will be honest and I jumped on the high fat, high protein bandwagon and it just made me sick. Thinking that I could eat all this fat, it just does not work for me. Fat controls hunger through the release of hunger hormones like CCK, GIP, and GLP. Fat intake releases ASP, which is a fat storing hormone in its own right. Combine Fat with Insulin (sugar) and you get another fat storing hormone engaged. Fat carries a large some of calories per gram. To low fat and you will have a hard time with the hormone testosterone, which will slow fat loss and delay muscle gain. Best approach, do not overdo the fat, especially when it goes along with a starch. 4. Eat Fat and Sugar Sparingly: Like I mentioned above Starch and Sugar together provide a major impact on insulin production. Fat alone has little influence, but fat / starch combined together….Just think of the firehouse when the trucks start up with all the lights flashing. Its a 4 alarm fire!! This generates the perfect recipe for fat gain: caloric excess in the context with fat storing signals. This combination, much like a left and right hook, causes the fat storing hormone triumvirate, simultaneous release of insulin, GI and ASP. We are not talking apples and peanut butter, oats or nuts, but ice cream, bread and butter, pastries and the like. 6. Life is to short: Take 10% of all your meals for a week and eat what you want. For example, if I eat 6 meals a day for 5 days, that is 30 meals. On Saturday I can have 3 cheat foods without the guilt hanging over me. I might have a beer, a burger and fries. Sure I mentioned some things relating to fat storing, but we also need to live and have certain rules in place so you can enjoy them and reward yourself —- without feeling guilt over them. 7. Your either in it to lose it or you’re in it to maintain it: Most people I know do not use our system of healthy eating year around. They cheat here and there, beat themselves up and don’t get into this rhythm that we have talked about. Pick a few times out of the year for fat loss. Generally, the best times because of life, kids and holidays are the following; The New Year, 4 weeks before Memorial Day and right after school starts. We have been through this so many times, we know that any other time you will just be spinning your wheels. Get on the plan and understand no professional magazine model lives that lean year round. 8. No you trigger foods: What foods / drinks send you off the reservation? You need to know them. What can’t you have just one? These are the foods that send the cravings, mood, energy…..wacko. 9, Believe you are a fit-lean-healthy person: What is the difference between you and a fit person who seems to stay lean all year round? They believe they are. They live this lifestyle. Those of you that yo-yo all year round believe you will yo-yo all year round. You may not think or say this out loud , but the psychology is there to back it up. This can be a whole segment in itself, but you have the power within to do this. You just have to think it is a “MUST” and not a “SHOULD”. 10. Do what works for you: We are all individuals. You have to be a detective and learn what works better for you. There are really no hard rules, and you will find your own personal rules as you move forward. Nothing is hard and fast. The best rules for fat loss are the ones you create yourself through an understanding of your unique metabolic expression, psycho- logical sensitivities, and personal preferences.